I've been doing Executive Baord for two years, and I've never heard of Executive Session. I know that the last meetings of each year were closed to visitors, but my understanding was that these were basically dinners rather than meetings, so I didn't even go. Personally, my favorite thing to do at the end of a school day is go home and walk my dog. I suppose I once held more lofty ambition, but that's where I am now. Perhaps Executive Meetings are for hazing and I'll finally learn the secret initiation ritual. There could be masks. Maybe there's a secret handshake and a decoder ring. Hard to say. Nonetheless, I've gotten by without it for almost two years, so I'm not sure it will make a difference. Actually, there's a much more likely reason for the Executive Session. In fact, we're going to meet the chancellor. It will be worth it to me if I get to ask him a question. I have one in mind. He was at my school a few weeks ago for his "listening tour," but I had an Executive Board meeting that night and could not stay. From everything I heard, he did a lot of talking but no listening at all. He took no questions from the audience. He took them instead from a few aides who either culled them from the crowd or made them up. Who knows? We do know that Mayor de Blasio took over the city government over four years ago. We know that a whole lot of Bloomberg appointees are still hanging around Tweed, flaunting their particular brand of anti-union, anti-teacher ideological fanaticism. For me, this was a huge disappointment. I supported de Blasio against UFT''s first candidate, what's-his-name, the guy that told the Daily News editorial board that the city couldn't afford to give teachers the same raise it gave NYPD and FDNY. Understandably, he was mad that UFT didn't support him against Bloomberg Mach 3. But the fact that he stabbed us in the back after we stabbed him in the back did not suggest strong character or conviction to me, at least. UFT tried very hard to get me to work for what's-his-name. In retrospect, perhaps what's-his-name was going to do the right thing by us and we would've gotten a contract that didn't cause us to wait until 2020 for money we earned in 2009. Maybe my friend who's jumping to a Long Island district next year would have all her retro pay. It's hard to say. I have this thing about trust--once you violate my trust I never trust you again. What's-his-name, in my view, was not to be trusted. In any case, tonight I expect to get to ask a question of the chancellor. I kind of wish it were public, but I don't make the rules. In fact I had a blog I was going to put out about this chancellor a few days ago, but I'm holding it back until I know a little more. Maybe tonight I'll learn something. What would you ask the Chancellor? Now let's be fair. He's not actually responsible for the state law that mandates all the nonsense in evaluations, and almost everything you've experienced has not been under his supervision. He wasn't the one who kept all of Bloomberg's people on at the DOE well past their sell-by date. It wasn't him who hired your Boy Wonder supervisor. Honestly, until the man has actually done something, it's hard to say much about him. He certainly sings and plays better than any of his predecessors. 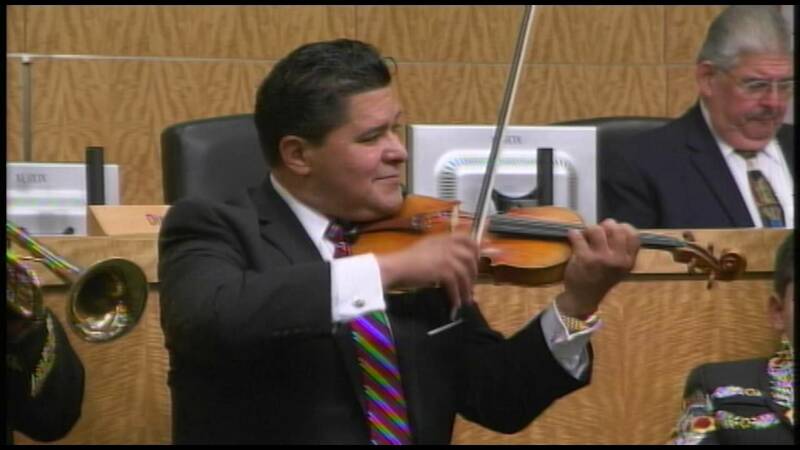 I'll tell you something--the violin is a real challenge. Basic mastery of it is a lot harder than guitar. When you first pick it up, it's like your strangling a cat. People you live with toss you out of your apartment and you can hardly blame them. You know what you sound like. Of course, when you can finally make music with something like that it's a thing of beauty. So without piling on for things over which he's had no control, what would you ask? If you come up with a better question than the one I have, I'll use it. Alas I won't be able to write about this top-secret session. But most things get out eventually, one way or another.